1.625" x 1.625" x 0.375"
COMMENTS: Used for lotion bar samples. Really cute, about the size of a silver dollar. "Sand Dollar Make Me Holla!!!" 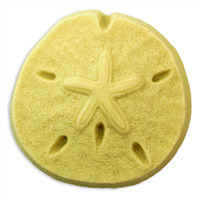 COMMENTS: I love these sand dollars. Love the designon then, so detailed. Very easy to isare. COMMENTS: I am super impressed with this plastic mold. I was prepared to wrestle with the release or at the very minimum stick in the freezer for a bit...but nope, I just pressed and out popped my soap. Same thing with the wax....no issues what so ever! 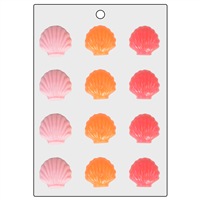 "How do you recommend getting melt and soap to release from these molds? I usually spray rubbing alcohol down before I pour and this isn’t working. I’ve broke one mold already trying to get the soap out and finally just left it in the mold. " 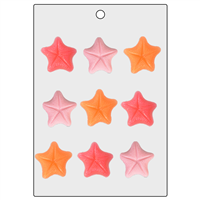 Staff Answer We do not recommend spraying plastic molds with anything if making MP soap. We recommend placing the molds in the freezer for about 30 minutes. Remove and let sit at room temperature for 15 minutes. They should pop right out after doing this.